After you display the Supervisory Schedule, you can modify it to change the time, type of batch processing, or environments to process. 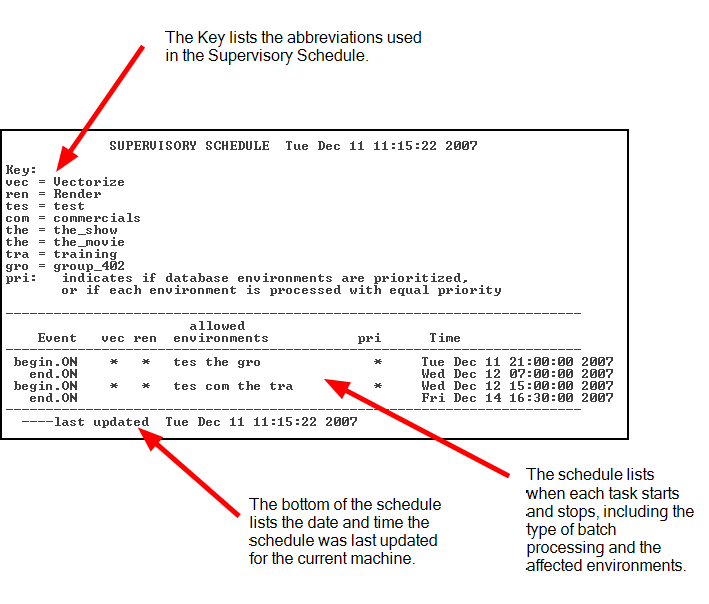 For more information on modifying the Supervisory Schedule using the Setsup command, see Setting a Supervisory Schedule. You can display the Supervisory Schedule for only one machine at a time. 1. Type Showsup in a Linux shell and press [Enter]. The system prompts you for the machine whose Supervisory Schedule you want to view. 2. Type the name of the machine for which you want to define a Supervisory Schedule. If you press [Enter] without specifying a machine, the command uses the machine name that appears in brackets. You can combine these two steps into one by adding the name of the machine you want to view at the end of the Showsup command. For example, if the machine you want to view is called hickey, then you would type the following command in a Linux shell to view its Supervisory Schedule.